Alpine travel is dynamic, so Arc’teryx designs for movement. Leveraging articulated patterning, underarm gussets and stretch materials, the Gamma LT moves with the body. 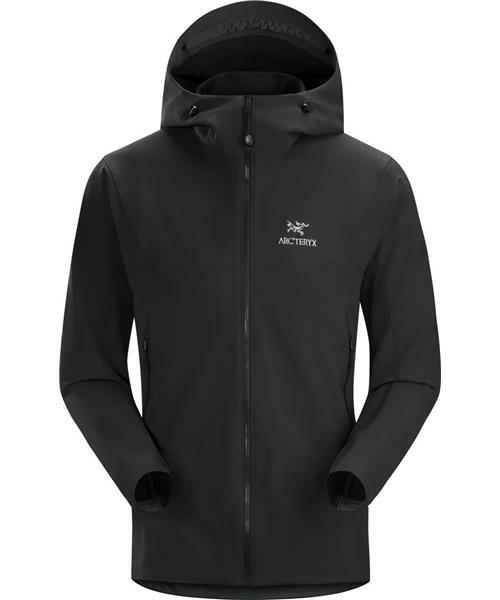 The Arc’teryx regular fit is streamlined and athletic while allowing room for midlayers. The helmet compatible StormHood™ delivers full coverage with a high level of visibility and freedom of movement, and the Gamma’s hip length hem and streamlined patterning allow it to lay comfortably under a harness or pack belt. Stretch gusset cuffs provide a secure fit, but push up easily for ventilation. Refinement and subtle innovation are Arc’teryx design obsessions. To facilitate heat dump without inadvertent opening, the Gamma LT employs the ingenious No Slip Zip™. The zipper’s unique construction involves a series of bumps on the top few teeth to prevent self-opening, but, as in many Arc’teryx pieces, the zipper may be rapidly opened with a single hand for almost instantaneous heat dump. This seemingly little thing clearly shows the Arc’teryx attention to detail. Gamma LT Hoody - Mens is rated 4.8 out of 5 by 12. Rated 5 out of 5 by Chrisjabarron from Amazing fit and flexibility Been wearing the Gamma LT for 2 weeks now, very well cut jacket which beads up after a light downpour. I am a gardner so i wear the jacket for moderatly active movement. The jacket breaths very well and moves well when raising your arms. I now wear this jacket when its a bit to warm for my atom jacket and over other layers if it looks like it might rain a bit though out the day, It breathes better than i imagined and can get a bit cold during the evening, so be aware it is a jacket made to move in or to layer if your not quite sure what the weather might throw at you. Rated 5 out of 5 by Primoz from The best softshell I have owned This jacket is just amazing. Fit is so good that you don't even know you wear one. Freedom of movement is unparalled. Also the quality of the material is great, feels so good next to skin. I use this for spring time backcountry skiing trips, for hikin in everyday wear when temperatures drop. I find it a good springtime isulator. Wind protection is great and breathability top notch. I choosed this one before Gamma MX hoody as it's less bulkier and lighter. I would recommend this jacket to everyone looking at a great softshell jacket for year-arround use. Rated 5 out of 5 by rusco7614 from A great softshell all-rounder I've used many different softshell jackets over the last 20 years, and this is one of my favourites. Softshell clothing is all about balancing protection and comfort, and this jacket gives a really good balance of both - a high degree of wind and weather resistance, while also having excellent breathability, not too much bulk, and a noticeable amount of stretch. Being uninsulated, it is usable over a wide range of conditions, worn over an Atom LT, Powerstrech and baselayer in winter, or just over a baselayer T in the summer. It is not as wind and weatherproof as my Venta SV, but noticeably more breathable, less bulky and less ’cumbersome’. It isn't as breathable, and doesn't work as well under a Gore-Tex shell as my Acto MX, but does offer better wind and weather protection, and has a much better hood (the peripheral volume adjustment gives a MUCH better fitting hood than the height volume adjustment on the Acto’s hood). I was very unsure about the non-velcro adjustable cuffs to start with, but now really like them. There is enough room to get gloves tucked up inside (even when wearing a bulky altimeter watch), and of course they are dead easy to get tucked down inside a bulky glove or mitt, due to their lack of bulk. The only time I miss a wider, adjustable cuff opening is in warm weather when they would allow a bit more ventilation. The pockets are a good size and well positioned. Otherwise the ‘clean’, uncluttered design is really nice - just the right amount of features. So - not as good a full-on winter jacket as my Vento SV, and not as good a layering or summer jacket/shirt as my Acto MX, but a really good, versatile all-rounder - a good one to pack if you have no idea what the weather is going to do, or you haven’t built up a wardrobe fully of Arcteryx softshells! Rated 5 out of 5 by 4RV3 from Good looking jacket with great fit This is really great jacket from Arc'teryx! It's made from nice cozy material with stretch. It sheds very little rain for a while and it block's wind nicely. One time i had to use it as hardshell when storm caught me and this jacket gave up after 2 min of really hard rain but it's a softshell so I can't complain. It's light, very well fitted and zipper just run's back and forward with no problems. If you are looking for light and good looking softshell jacket this is one for you. PS: I'm 176cm and 65kg and I got size S. It is perfect for me. Rated 5 out of 5 by DomL from Near perfect. Over the years, I must have owned about twenty soft shells, as I could never find one with the right balance between weather protection and breathability. Then I found this piece. Fantastic wind and water resistance. With the DWR working at it's fullest potential, anything other than a full-on downpour it dealt with admirably. Wind resistance is excellent. Very little to choose between this and my hard shell. Yet it's fantastically breathable. When working hard, you can actually see the perspiration working its way through the fabric. I run hot, so this is a very big benefit for me. The fabric is incredibly durable. I've had it two months and I've ran it pretty hard and it's as-new. Great fit, detailing and quality. Of course. That's a gjven with Arc' pieces. The hood fits as well as any - very similar in design on my Alpha SV. It's not 100% perfect - for some reason the pocket zippers don't fit under the little garages, and the main zipper isn't a free-riding design like the one on my Beta FL and Alpha SV. Very minor quibbles, though. All-in-all, an absolutely brilliant piece and the best softshell I have ever owned. By a very long way. Rated 5 out of 5 by Nutters from Excellent Jacket I bought this to replace another soft shell and love it. It fits really well, has long back length and sleeves and is surprisingly weather resistant even though it has no membrane. I have taken it rock climbing and found it moves really well, doesn't lift out the harness, pockets aren't impaired, doesn't get damaged against rock and the hood easily covers my lid. I also have taken it up Tryfan in winter conditions as a mid layer and until the wind got apocalyptic it was great as a stand alone, and I was warm using it with only a summer baselayer and a pro shell. It doesn't overheat in cooler conditions either. Would highly recommend this to anyone wanting a year round shell for different stuff. Isn't too bad on price either, only niggle would be the hood is slightly huge without a helmet. Otherwise it's awesome. Rated 5 out of 5 by Sciattolo from Great softshell jacket I bought this jacket for winter mountain biking and regular downhill skiing at ski resorts (no off-piste or other extreme skiing). The temperature has varied from -10 C to +5 C from calm to moderate wind conditions. So far I haven't used this garment in rainy weather (and as far as I can tell, it's not intended to be used such way). In heavy activity, as mountain biking, I managed easily in - 5C with merino wool undershirt and Rho neck gaiter. As judged by the steam evaporating when stopping, I'd say the jacket breathes pretty well. While skiing at the Alps, I used Rho AR as a middle layer and managed just fine. Occasionally while sitting in a lift without any wind cover, I felt a bit chilly. I must mentioned though that sun where shining the whole week, so that has a huge impact for the temperature regulation (my jacket is black). Taken that into account I could conclude that jacket is breathable and warm enough during moderate activity. For heavy activity, I would like to use somewhat more breathable garment. Design is great and size L is in line with my other Arc'teryx equipment of the same size. Sleeve openings are pretty tight, make sure to use a glove that goes over the sleeve. This jacket is a bit longer and therefore ideal for biking and skiing. This fit's me better than Gamma MX Hoody which was my other option. I'm very pleased for this product. Rated 4 out of 5 by Grant from Good product for Ranier summit This was my second insulation layer which I put on about 10,000ft on the way to Ranier summit. It did the job nicely. Would prefer an outdoor chest pocket, but thats a small gripe. Put it on in the elements, zipped up and fit like a glove with the helmet fitting nicely UNDER the hood.